Kahuku (The dirtiest beach on Oʻahu) - at James Campbell National Wildlife Refuge (JCNWR). Enter the refuge off Kamehameha Hwy at Mile Marker 14 in Kahuku, just north of Marconi Road. Do not go to the JCNWR office. Follow Plastic Free Hawaiʻi banners to the beach. 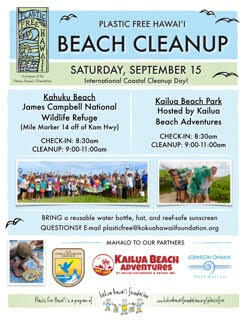 Check-in begins at 8:30am, and cleanup is from 9:00am - 11:00am. Find details here. No RSVP required. BYO reusable water bottle and reef-safe sunscreen.